iCAM Entry™ is a software application that enables easy addition of Iris Recognition to any Wiegand based Physical Access Control System (PACS) or Time & Attendance solutions. Single door operation with iCAM alone also possible by the enabling the On Device Enrollment feature which is password protected. iCAM Entry™ ensures both simplicity and high performance. Encrypted iris templates are stored in the device with or without user biographic information. 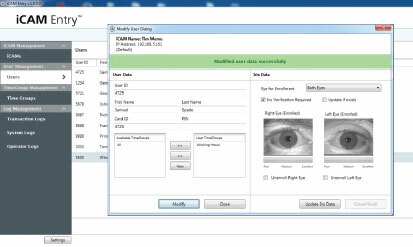 iCAM Entry™ simplifies the installation and operation of the iris recognition. 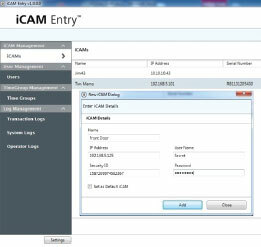 iCAM Entry™ provides a simple intuitive GUI for enrollment and Data distribution to other iCAM 7101 devices. With iCAM Entry™ all iCAM’s simply appear as a conventional card reader to virtually any wiegand based access control and Time and Attendance systems.